Android powers about 80% of the world’s smartphones and 50% of US smartphones. Google Search, Google Play, YouTube, Google Maps and Gmail are the second through sixth top smartphone apps. Google Chrome is the top web browser worldwide, accounting for about 40% of web traffic. Google doesn’t just want Chrome to be your web browser of choice; it wants to be your hub for productivity, entertainment, reading, browsing.To further this end, Google created Chrome OS in 2009. Centered on the belief most people spend 90% or so of their time surfing the Internet, Chrome OS devices run only run Chrome. While this may sound pointless, the combination of Chrome’s extensive list of web apps from Web Store and other online services, Chrome OS devices have the ability to do pretty much everything your computer can do. However, this device marketed as a companion to your regular computer, just lighter and more portable. The crazy part: the Samsung Chromebook is only $249 (with the cheapest Chromebook coming in at $199). The Samsung Chromebook looks and feels like a cheap, plastic Macbook Air. The comparison is apt, since the two have about the same weight (~2.4 lbs. ), screen size and resolution (11.6”, 1366×768), number and type of ports (two USB, power, monitor output, and SD card reader). Just like the Air, the Chromebook is ultra portable, so you can just throw it in your bag and work where ever. Don’t throw it too hard thought: the Chromebook’s plastic material has a pseudo-aluminum paintjob, which gets scratched pretty easily. The matte screen doesn’t reproduce some colors correctly and due to its relatively low resolution, my eyes started to fatigue while reading text for longer periods of time, something that never happens on my 2560×1600 touting Nexus 10. The speakers produce shallow sound that is not amazing but not bad. The trackpad is plastic instead of the Air’s glass and feels way worse. It’s not too bad if you’re coming from an older Windows computer and it’s really just a learning curve for our spoiled fingers. The Chromebook’s keyboard is almost a carbon copy of Air’s both in terms of appearance and ease of use, albeit a bit cheaper in quality. 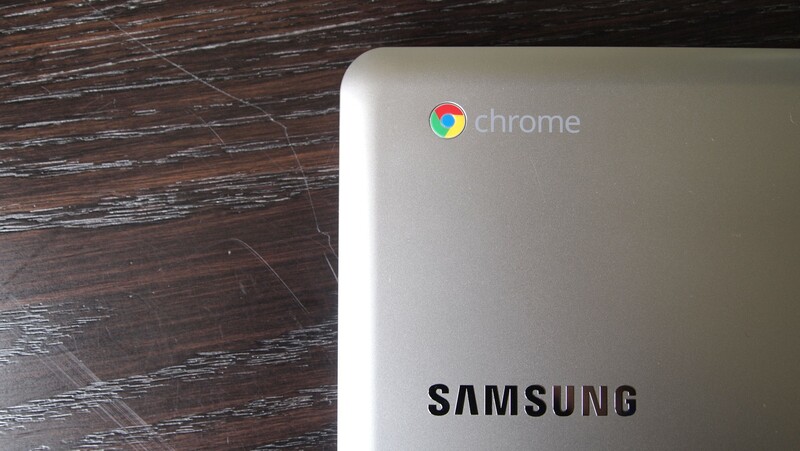 Unlike other Chromebooks, Samsung’s device runs on an ARM processor, the same mobile chip found in the Nexus 10. The device only has 16 GB of storage and Google offers 100 GB of Google Drive storage for free for 2 years. Paired with 2GB of RAM, the Chromebook does a pretty decent and speedy job zipping around the web, but can get caught up when you try to have 25+ tabs open. Chrome OS is just Google Chrome with stripped down Windows desktop feeling. Most of the time, it is blazing fast and simple. I only had one random reboot when I tried to use the screen capture feature during a Google Hangouts video chat. Since it boots in under 10 seconds, I was back in my video chat before the other person had known what had happened. However, this is not a laptop. But trying to access my information stored in my different cloud services was hit of miss. Document editing and searching was fine in Box. Evernote worked less than half the time. When I tried to enable offline support for Google Docs in order to do some work offline, my Chromebook immediately become noticeably slower. It’s ARM processor just can’t handle some tasks very well, tasks that would make the Chromebook far more compelling. Some people will ask: Why would I want a Chromebook? Where does it fit in with my other devices? The Chromebook competes with the Macbook Air (specifically if you are thinking about getting one in addition to your bigger computer) and also with 10-inch tablets. For some who don’t own a tablet and are looking for an affordable companion device, the Chromebook is perfect option. I found myself far more productive while using Chromebook then I do when using my Nexus 10. But this Chromebook is limited as well. The next generation of Chromebooks should be out this holiday season and I’m waiting on those.